We can help you to create the learning environment you desire, starting with a quality facility built to last decades. We have the product knowledge, along with a flexible workforce to meet your unique timing challenges. We’ve been entrusted with a wide variety of educational projects, and we can deliver what you want, when you want. Sheboygan Falls, Wis., is a small town along the western shores of Lake Michigan, 45 miles north of Milwaukee. The community long had desired to replace its aging middle school, which opened in 1928. Following the passage of a $30.9-million referendum by voters late in 2016, ground was broken in June 2017 on a new, 128,000-square-foot educational building, with a capacity of 550 students in grades 5-8. The Luxemburg-Casco School District serves nearly 2,000 Northeast Wisconsin students annually through four schools: primary (4K-2), intermediate (3-6), middle (7-8) and high school (9-12). Located between Green Bay, Door County and Lake Michigan, this rural educational community has been in existence since the early 1900s. Fox Valley Technical College (FVTC), located in Northeast Wisconsin, was experiencing a 30-percent increase in its enrollment. Those seeking health care training, including existing professionals and students entering the field, were in need of a modern medical environment where real-life patient scenarios could be replicated, using the latest, technologically advanced equipment. With a significant need in the region for auto technicians, auto collision specialists and diesel medium/heavy truck technicians, NWTC wanted to expand its educational programs in those areas. To do so, the college needed a larger facility, equipped with the modern technology. Funding was achieved as part of a $66.5-million referendum approved in 2015. North Greenville Elementary School is a new K-4 instructional facility, located in a quickly growing community within Northeast Wisconsin. Built to alleviate overcrowding at the city's other elementary school, it also was designed to allow for future population growth. Oaklawn Elementary School is a K-5 instructional facility with more than 400 students, located on the north side of Oshkosh, Wis. Built new in 2013, it replaced a 60-year-old school of the same name, sitting on the same site. The Gehl-Mulva Science Center at St. Norbert College in De Pere, Wis., is a state-of-the-art facility constructed from 2013 until early in 2015. The new structure replaced a building that was nearly 50-years old, Minahan Science Hall, to serve St. Norbert students as well as those from the new Green Bay campus of the Medical College of Wisconsin, which admitted its first students in July 2015. The Mulva Family Fitness and Sports Center is a $25.5-million, state-of-the-art complex devoted to fitness, wellness and athletics at St. Norbert College, a Division III institution in De Pere, Wis. The 128,000-square-foot expansion and renovation wraps around the original facility, built in 1979. H.J. Martin and Son was contracted to provide all of the glass/glazing and aluminum curtain wall installation. 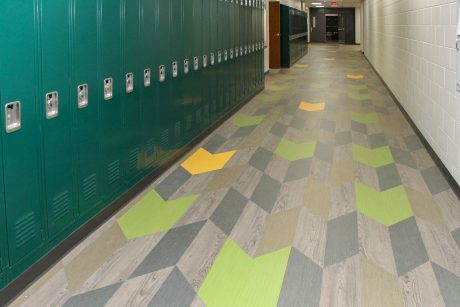 St. Mary Elementary School wanted to move away from an institutional feel as part of a flooring overhaul, including the replacement of failing VCT. As a faith-based educational facility, it also desired to incorporate that aspect of its curriculum into the like-new space. As part of a shift to a more technology-based, collaborative approach, St. Mary Catholic Middle School reconfigured its educational spaces. The 59,000 square-foot facility's new classrooms were arranged in grade-level pods, with adjacent group learning areas. Glass & Glazing installed Graham Windows, Hopes Windows, Omega doorframes, SAFTI Fire rated frames and glass, Blumcraft doors, Circle Redmont glass flooring, Serious and Bendheim Glass, and completed Historical Window replacement. The job consisted of remodeling an old building and an addition. Many specialty products were used to maintain the historical look of the building. Required careful planning due to the limited jobsite area on the campus of UW Madison. Although not open for classes at the time, busy streets and other campus buildings limited the amount of deliveries and parking. HJ Martin Walls & Ceilings completed exterior studs, interior studs and drywall with high performance products. Carpet tile and porcelain tile was also installed by HJ Martin. Due to the building layout, it was difficult to scaffold to build soffits, yet HJ Martin provided installation in private and public collaborative spaces, and successfully incorporated lots of shapes and designs. In order to ensure the building was open for school, crews completed the job on a tight schedule and worked clean throughout the summer. HJ Martin installed over 5,500 square yard of carpet/carpet tile and 4,200 square feet of LVT; along with sheet vinyl and linoleum. Experience in the industry allows us to recommend the solutions that will offer you the greatest resilience when it comes to high-trafficked areas and flooring that anticipates lots of wear and tear. On a tight schedule, HJ Martin provided the manpower and availability to work to meet timelines based on the school year. HJ Martin Glass & Glazing teams installed a beautiful Kawneer curtainwall, storefront windows and entrances. The large curtainwalls were built during a very snowy, icy winter which challenged, but did not delay or alter the installation. HJ Martin's manpower and availability to meet tight timelines ensured the renovation did not interfere with college life. Installation of Kawneer curtainwall, storefront windows, entrances, and sunshades. On a tight timeline to complete the Glass & Glazing installation prior to the start of the school year, HJ Martin equipped this project with teams of crew members that stuck closely to the outlined schedule. Working from aerial lifts, the HJ Martin team set 1,200 pieces of locally-manufactured glass, weighing up to 580 pounds apiece, after building and installing 52,000 square feet of curtain wall. One of HJ Martin's largest single phased Glass & Glazing jobs completed at the 300,000 square foot research facility. HJ Martin welcomed the difficult exterior finishing project, overcoming the design, safety, and even weather challenges presented. Special features, including sunshades for each floor on the south side of the building and 60 automated glass vents that bring fresh air in once a day, helped the Institute achieve its LEED Gold certification.